The Cleveland Browns finally sent the faithful home with something to cheer about, beating the Jacksonville Jaguars on Sunday, 14-10. It wasn’t easy and it wasn’t pretty, but the Browns found a way to get the job done. In typical Browns fashion, the team should have gone up 17-10 when Phil Dawson kicked a 38-yard field goal that was probably good but the refs ruled was a miss with 2:49 left in the game. Jacksonville then marched down the field all the way to the Browns 3-yard-line, where Jacksonville quarterback Blaine Gabbert’s third-down pass was incomplete as time expired, sealing the win. So how did the Browns hold up to pregame questions? Can the Browns score a touchdown in the first quarter? Nope, still 0-10 on the year. Can the Browns score a touchdown in the third quarter? Nope, still 0-10 on the year. Can the Browns score a touchdown at home? Now we’re getting somewhere. Chris Ogbonnaya scored from the 1 in the second quarter and Josh Cribbs caught a 3-yard pass from Colt McCoy in the fourth. Can the Browns stop the run? 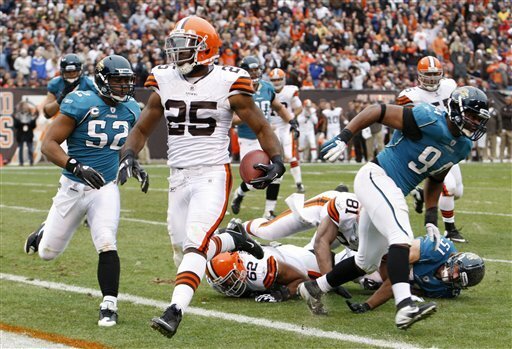 Cleveland held Jacksonville to just 3.7 yards per rush and limited Maurice Jones-Drew to 87 yards. They also stopped Jones-Drew twice inside the 5-yard-line on the final drive of the game. Can the Browns move the ball against the Jaguars? The Browns had 334 yards and 20 first downs against the No. 4 defense in the NFL. In addition, Ogbonnaya had a career-best 115 yards (with a long run of 40) and a 5.5 yard per carry average against a solid run defense. Does the Browns offense and McCoy have the proper amount of “lust for the end zone?” Against the 5th-best pass defense in the league, McCoy spread the ball around to seven different receivers, with Greg Little catching a team-high 5 passes and Jordon Norwood pulling in a catch-and-run for 51 yards. So after all the injuries and the ups-and-downs of the season so far, the Browns find themselves one ridiculously botched kick from being at .500 after 10 games for the first time in what seems like forever. The team still has a very long way to go, but they are competitive against the teams they should be competitive with. And, at least for one game, the offense shook off some of its problems and did enough to help the team pull out a win.